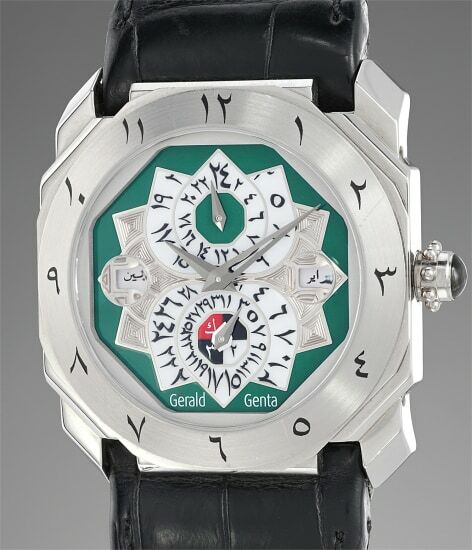 Gerald Genta’s name is forever associated with some of horology’s greatest icons: Omega’s Constellation, Patek Philippe’s Golden Ellipse and Nautilus, Audemars Piguet’s Royal Oak, IWC’s Ingenieur, and Cartier’s Pasha models. Born in Geneva in 1931, he received his Swiss diploma in jewelery design and goldsmith training. It is in the mid-eighties that Genta came to be known not only as an extremely gifted designer but also an audacious independent brand that broke all the rules and set new paths. In the 1990s, he did not limit himself only to designs but explored new case materials (bronze) or complications (in 1994 his Grande Sonnerie retro was the world’s most complicated wristwatch). The case of the present Octo Mosaic Perpetual Calendar seems to be an evolution from the Royal Oak he had designed some twenty years earlier, with its octagonal case shape, taught lines and very masculine wrist presence. Presented in 2007, this watch is n°1 of a limited edition of 100 pieces. Made for Arabic speaking markets, the present watch features perpetual calendar indications in Arabic as well as a GMT function. The dial is inspired by moucharabiehs (windows with carved wood latticework in traditional Arabic architecture) with a green and white color scheme. Offered full set and in excellent condition, the present watch is sure to delight with its unusual attributes.